What I mean is, is the idea you create a character, play the main game, then use same character to play all the expansions, getting more and more powerful? I thought that was the idea and was one of the features that drew me to The Quest in the first place. I played the main game, then isles of fire and ice, then Celtic rift, then HOL1. I found combat in Celtic rift easy, but quests challenging. The combat in HOL1 was real easy, barely took damage until last fight. The drain health and drain Mana swords from Celtic rift probably had a lot to do with it. Still quite a few places I haven't explored. Thinking I'd start fresh with 2 characters, one for the Celtic story line and another for the HOL story. Didn't even try Thor's Hammer cuz I got enough exp from main game. Sorry for rambling. The way we did it in the Classic version was that each new story arc started at a low level and you rose higher. Haven't done it that way so far but we might go back to that for some story arcs. What do you think? We have two new expansions that begin new story arcs this year-Macha's and another but also going to be porting HOLIII and others. The HOLS will definitely be higher and higher level. Here are the different story lines. Thor's Hammer. Thor's II probably next year. Mithril Horde I and II -designed to be higher than HOLIII and V respectively. Celtic I, II and III. Asteroids I, II and III. Exotic land not named yet. New. Both ways have benefits. One thing I like about arcs starting at lower levels is it encourages players to start a new character, maybe try a different build. As for arcs starting at higher levels, if you use the same character, when the expansion refers to previous adventures, makes more sense from a story perspective. I got a kick out of the isle of fire and ice in HOL1. So perhaps Asteroids and Mithril Horde will start at low levels. Just for a reference point, with the expansions I mentioned and without any grinding and without completing all quests I was level 34 by the end of hol1. 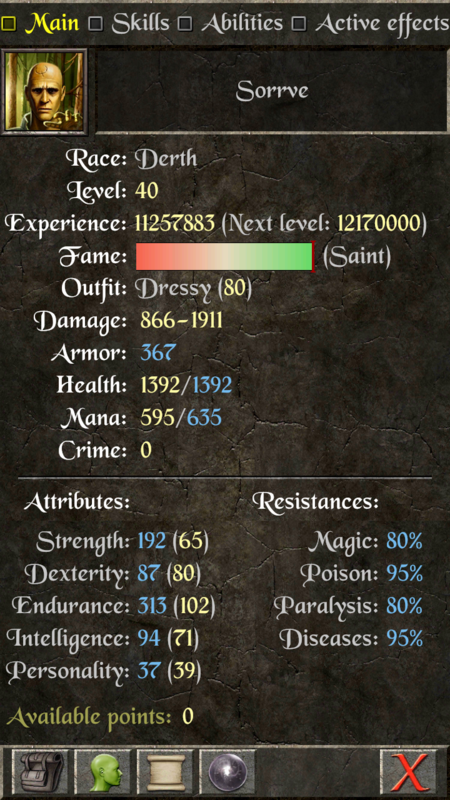 Maybe Macha's Curse should start at level 38 or 40 instead of 35. Thanks very much. 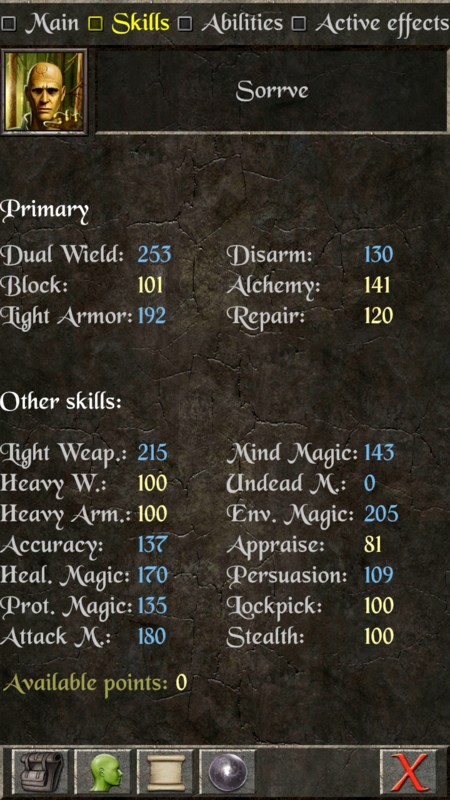 What are your Persuade, Stealth, Lockpick and Mind Magic skill stats? Here's my skills, I have various enchanted gear and can easily make enchanted gear to boost any skill too. (I wish there was gear with over 5000 enchant, I'm good up to about 8000 with my enchant suit and potions). Thanks very much. If the enchant were that high, wouldn't that make you close to immortal? DeMenchev who has helped balance our games would have a kitten. Let me try it in Macha's and see what happens. I don't know if it's possible. It could be that the high enchant would somehow wrap around and become a negative. Let me also ask Elendil if that's possible. I like my single character, but balance is definitely a concern. I will snapshot my stats when I get home, but if I remember correctly, they blow yours out of the water. A happy middle ground would be awesome. On one hand, the HP and mana leech can feel ridiculous when fighting normal mobs, but on the other hand, some mobs do 90-95% damage to you in a single hit, and the fight wouldn't be sustainable without the leech. Not sure what the answer is, but don't make me start over.... I am attached to my main. Cat, one thing that may be worth looking at.... I played all of the expansions in level order, and I am still wearing a few pieces of gear from Thor's because they are better than anything else that I have found so far. Just looking at sheer stat weight versus what it would cost to enchant them that high, there are no comparable pieces in the later expansions. Macha's will have better gear. Luko I, II and Celtic Rift are ports so didn't change the gear stats very much. Can think about that for future ports. Elendil says he doesn't know what would happen if gear were enchantable to high numbers and doesn't see the point of it. We could test one piece at 1500 and see what happens. My guess is that at some point, the numbers will wrap around to a negative. I'm enjoying the Quest with my original Nogur but I'd like the option to start a new low level game and create a new player that's a Rasvim and bowman to go through the expansions. When can I do that? When we do Asteroids probably or Cursed Chess Set.